Bookings are made by contacting us. A minimum 20% deposit is required to secure your cupcake, cookie or birthday cake order/date. Deposit for a wedding cake is 30%. Deposits are due 1 week after receiving your Cake Confirmation Letter. The balance for Celebration Cakes, Cupcakes or Cookies, is due two weeks prior (14 calendar days). 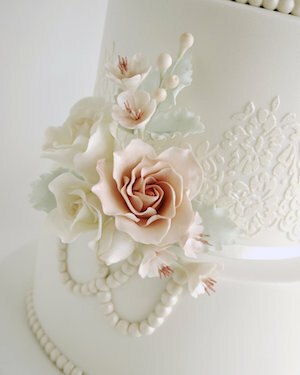 The balance for Wedding Cakes, and those requiring large amounts of sugar work is due 6 weeks prior (42 calendar days). Please note, that many decorations (plaques, fondant flowers, custom stands, gum paste models, monograms, craft on wires, etc.) may be made more than two weeks in advance to your pick up date. In this instance the deposit required may be greater than 20%. This will be agreed in writing prior to placing your order. New bookings may be accepted under two weeks, however, they will only be accepted at the discretion of "Cake Me To Your Party". Full payment will be required immediately, and no changes will be permitted. "Cake Me To Your Party", reserves the right to refuse any order at any time, for any undisclosed reason. In the unforeseen event that your order cannot be produced for reasons outside of our control, a full refund will be given. A future order at 50% cost reduction will be provided as compensation, with no further claim considered. Any deposit or final balance paid according to the conditions above is non-refundable should you choose to cancel your order. If you have pre-paid the full amount for your order and the balance has not fallen due according to the conditions above, then the pre-payment amount will be refunded less a 20% deposit. Any alteration must be agreed in writing. If it is possible for the alteration to be made, a fee may be charged. Not all alterations are possible due to complexity and/or time available to complete a change. Cash, Direct Deposit, Bitcoin, or Paypal (3% fees apply to Paypal transactions). We deliver and setup all our wedding cakes. All other cake/dessert deliveries are subject to availability and must be confirmed and paid for by your payment deadline. If we are not delivering your order, a pick-up time from our Sunbury location will be confirmed with you. Please contact us to order, and read the disclaimer so you are fully informed of the right decision for you.